On the morning that Deb and I saw Rich’s awesome turtle, we also saw a bunch of fun birds. Springtime is the best time of year for Central Florida nature photography. Some of our winter visitors are still hanging around, the migrants start to move through, and the local birds get all spiffy-looking for courtship and breeding. So I was excited to get out and see what we could find on a nice spring morning at Orlando Wetlands Park. There are so many Black-bellied Whistling Ducks at Orlando Wetlands Park right now! Deb and I were greeted with their happy, cheerful whistling calls. 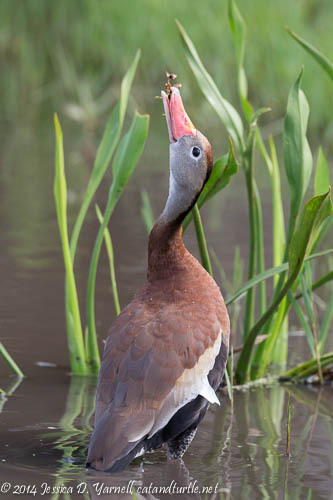 The whistling ducks are my favorite ducks. The large flocks were on the wrong side of the light, but we found a small group of them in a shaded spot. As we watched, one reached up to nibble on some flowers. It was really cute. The wading birds are all ready for springtime in their bright pretty breeding colors. 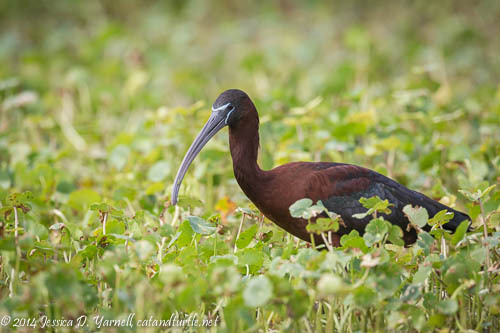 We saw Great Egrets with green lores, a Tricolored Heron with a nice white plume, Snowy Egrets with lacy plumes and red lores, and this Glossy Ibis with his blue face. I like how the vegetation at Orlando Wetlands is nice and low, which lets me get down low with my lens to photograph the birds at eye level. It’s very different than Circle B, where the berms block some of the best views. A lot of the wintering ducks have left. 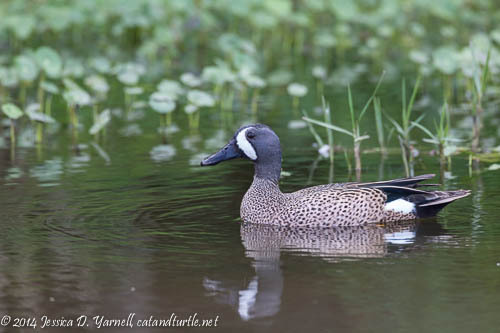 But the Blue-winged Teals are still around. We got good views of both the male and female teals. There was a Cinnamon Teal sighted recently at Orlando Wetlands Park, but we didn’t see him. Too bad, he would have been a lifer for me. Our best birds of the morning were the Snowy Egrets, who put on a good show for us. I spotted them mating from a good distance away. We got closer and sat for a long time, encouraging them to do a repeat performance. Of course they didn’t cooperate, but they did do some nice courtship dances for us. I love the little noise they make when they are fussing at each other! 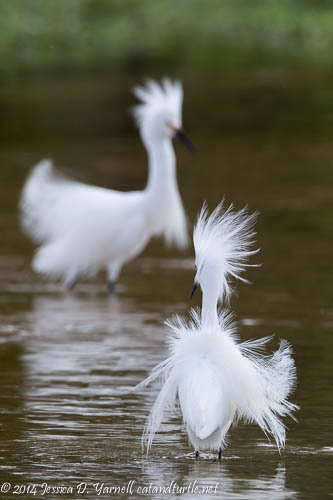 The Snowy Egrets get beautiful lacy feathers on their necks and backs, and they puff up their feathers to strut for potential mates. The light was definitely not on our side on this morning. We were shooting against strong sidelight, or full backlight, for a good part of the morning. But it was great to catch up with Deb, and we laughed together at the silly Snowies as they danced and fed. I loved the shot above of the fisher-bird as he struck the water to grab a fish. I think he missed! 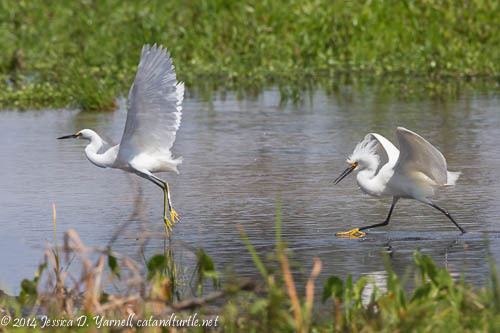 Every time Deb and I would decide to get up and leave, the silly Snowy Egrets would start a courtship dance. Of course! They couldn’t do it while we had our cameras ready. They had to wait until we’d packed up, and then start! At one point they did a great mid-air dance that was just amazing to watch. I hope Deb got it – I had too much lens! I moved along to photograph some Roseate Spoonbills, and when I looked back, I saw the two clowns above chasing each other. Yep, it’s definitely that time of year…I love springtime in Central Florida!! ⟵Yard Birding: Fun in my Own Backyard!